When you write an email either pick a built-in follow-up sequence or write your own. When it’s time to follow-up, and your candidate hasn’t yet responded to your email, MeetToby will automatically send your follow-up for you. You are in total control. 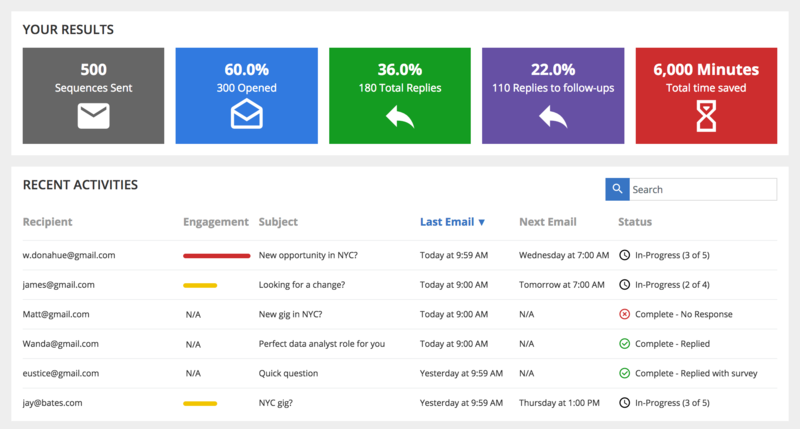 See the status of every email campaign or edit them in seconds. You’re busy and so are your candidates. Most candidates won’t respond to your first email. To maximize your response rates you need to consistently follow-up with every email you send. MeetToby makes this simple. Just write your follow-ups when you write your initial email and MeetToby will follow-up for you automatically. Dramatically improve your response rates by following up with a candidate at the perfect time. MeetToby tracks when a candidate opens your email or clicks on your links. Using this, MeetToby can determine when a candidate is hot and will email you right away. 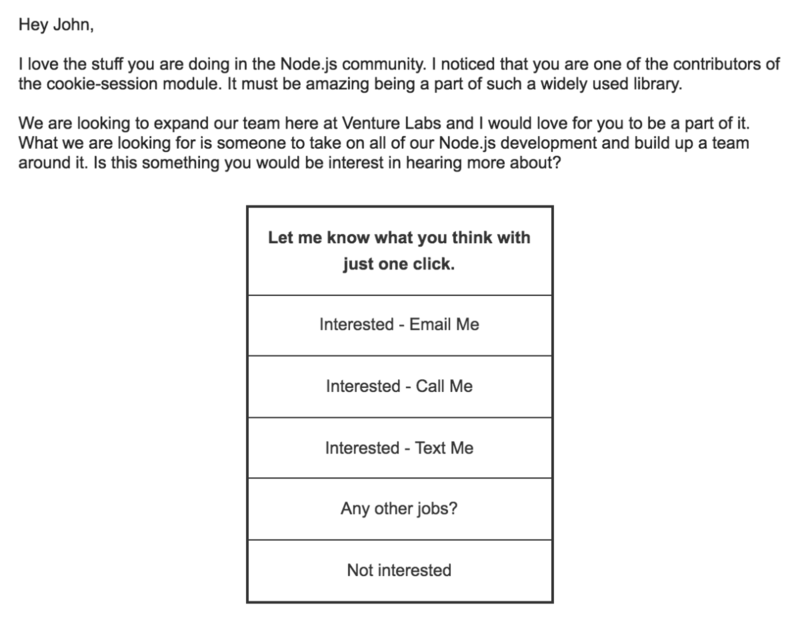 Easily create emails using your own templates, or use ours! MeetToby comes with some top-notch templates built right in. Templates allow you to save off a follow-up sequence and re-use it over and over again. Not only can you save off and reuse these templates but we will track the response rate of each template you create (So you can see what’s actually working…. and do more of that). MeetToby sends email through your existing Office 365, Exchange Online, Gmail, or Google Apps account. Candidates are much more likely to respond when it comes directly from you. Adding a follow-up couldn’t be easier. When writing an email just click the “Add Follow-Up” button, pick when you want the follow-up to send, and write your message. When it’s time to follow-up MeetToby will check if they have responded yet, and if not will follow-up automatically. 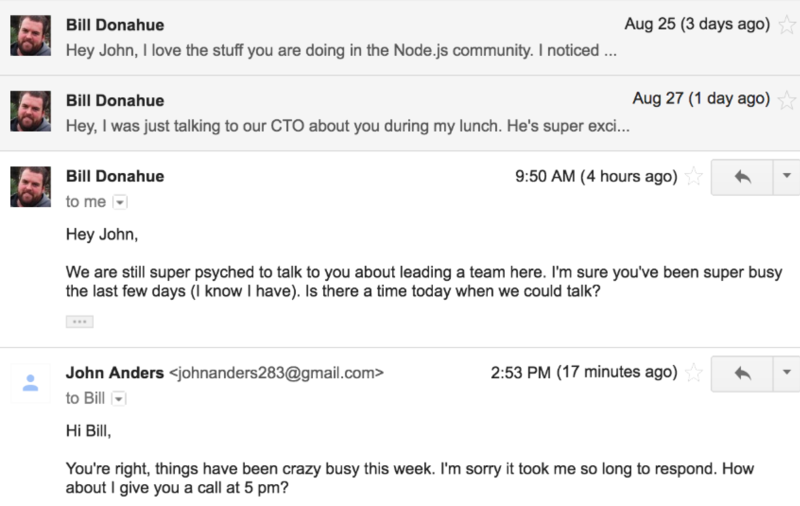 It may not seem like it but getting a candidate to reply to your email is a ton of work for them. We take it from four tedious steps to just one click of a button. As soon as they click a button you’ll get notified. Write your emails when it’s convenient for you and schedule them to send when your candidates are most likely to open them.